Researchers at the University of Wisconsin–Madison have developed a new measurement for the volume and activity of beta cells, the source of the sugar-regulating hormone insulin. In a study published in the August edition of the journal Diabetes, Weibo Cai, Matthew J. Merrins and colleagues used a PET scanner to detect minute levels of a radioactive chemical in the mouse pancreas. Cai, the senior author of the study and an associate professor of radiology, says that unlike previous methods for measuring the quantity of beta cells, the new test also measures how actively these cells are making insulin. PET scanning, or positron emission tomography, is used to detect minute quantities of tracers, commonly for finding cancer and metastases. This area is a specialty of Cai. Cai says the test may be used to evaluate treatments or cell transplants intended to slow or reverse diabetes. With a provisional patent filed through the Wisconsin Alumni Research Foundation, Cai has begun planning a series of human trials that could lead to Food and Drug Administration clearance for a new method to determine the quantity and condition of the beta cells. The first step in these trials would look at the distribution and potential toxicity of the radioactive manganese chloride used as a tracer. The chosen tracer has a short half-life, so the exposure to radiation is no greater than what is now used in the many PET scans used to detect cancer. Because blood sugar tests are cheap and reliable, Cai is not proposing to replace them for detecting diabetes. Instead, the new test could be used to track the effectiveness of medicines and other measures intended to dampen the immune assault that kills beta cells. The test could offer advantages over earlier methods to detect and analyze beta cells, Cai says. 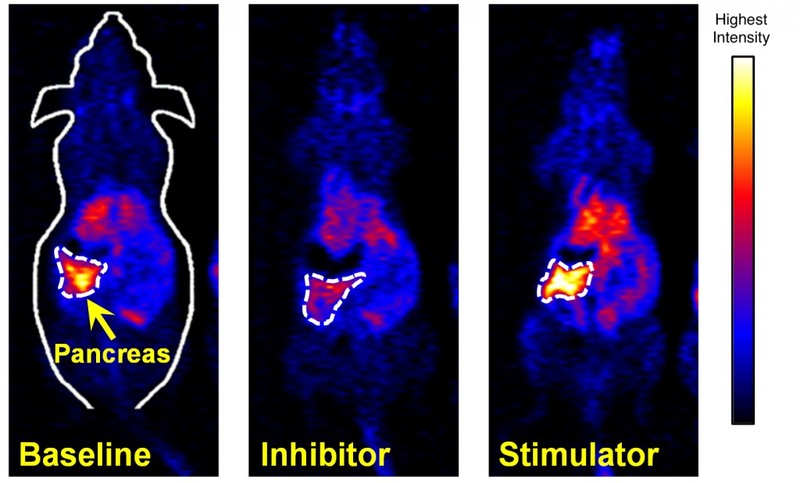 Some magnetic resonance techniques can give information about the quantity and function of beta cells, he says, but they use a dose of manganese chloride that is at least 1 million times higher than the new PET technique, suggesting an advantage in lower toxicity. The other authors included Matthew Merrins and Michelle Kimple, both assistant professors of medicine at UW–Madison who focus on diabetes research. ‘This study, with 15 authors, highlights great collaboration between UW–Madison departments and faculty with distinct expertise,” says Cai.